Additional photos reached us “just in time” before the auction at Bonhams Auction House in London is about to start (December 4th). They have a Ref. 3646 / Type D “Kampfschwimmer” in their Fine Watches & Wristwatches auction (LOT273). We published information on this watch earlier here. 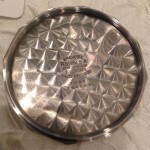 Interesting to be able to see the inner caseback. 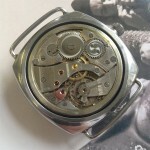 The surface of the inner caseback is completely decorated. More Information about the different finishings on inner casebacks of 3646 watches can befound in our book “History1” (page 166-167) and in our book “History2” (page 546-547). The Rolex engravings, in combination with the Rolex Cal. 618 / Type 1 movement (see photo below), are matching our database criteria for a Ref. 3646 / Type D.